A full-length air unit smooths your stride, no matter how fast or far you run. The Pegasus is one of the most versatile shoes available – it excels at everything from an easy jog for a beginner to a long run at an elite’s quick pace. It’s that kind of range that’s made it a popular pick for more than three decades. So, it’s somewhat strange that Nike would almost entirely overhaul the shoe (there’s nothing runners fear most than their favourite shoe getting ruined by an update). But, fear not, fellow Peg wearers: Amazingly, the 35 still feels like the Pegasus, with all the versatility you’ve come to love. Beneath that sporty new styling, the Pegasus 35 has a full-length air unit for the first time. Prior to the 33rd version, air had been limited to the heel, while the last two models used separate air bags in the heel and forefoot. This new, longer piece smooths out the transition from heel to toe, as you go through your stride. It’s still encased within Cushlon, the lightweight, responsive foam used in previous models. The upper features a considerable change, too. The new model gets a sleek bootie construction, with an exceptionally tall tongue and heel collar. We found the fit to be snug through the midfoot, yet generously roomy in the forefoot without being too wide. The upturned collar and pointed heel add to the sporty aesthetic. The redesigned Pegasus gets a sleek bootie construction, with a very tall tongue and heel collar. A mix of Cushlon (the foam long used in the Peg) and air cushioning deliver a reliably soft platform that still has some “pop” – that responsive sensation speedy runners crave, helping them get off the ground faster with each step. It’s that tried-and-true combination that makes this shoe appeal to such a broad range of runners, and allows Nike to hold the price at just over R2000. The Pegasus delivers a lot of value at that price. 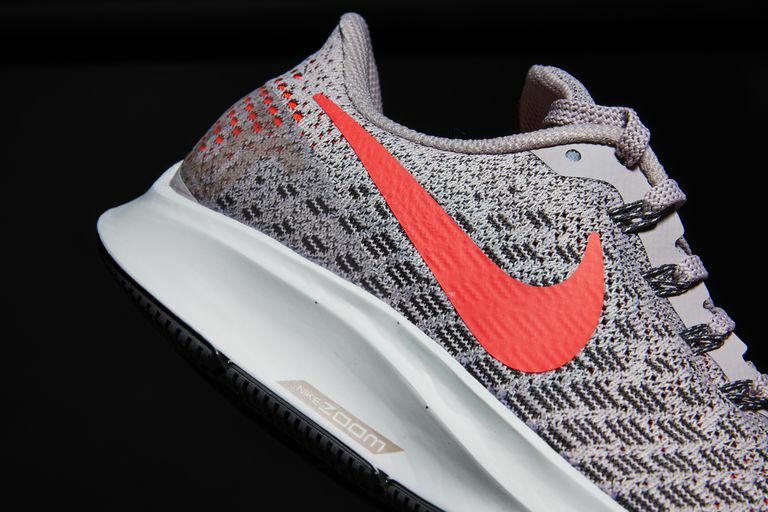 But, if you’re seeking something softer and lighter, look to the race-inspired Nike Zoom Pegasus 35 Turbo, which uses ZoomX foam for a speedy ride. 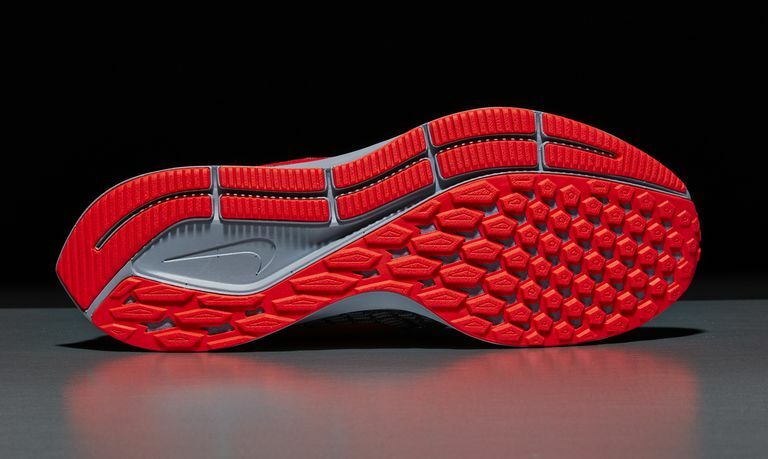 The Peg’s outsole has a great design for a smooth landing. If you’re one of the speedier runners who lands on the outer edge of your foot – toward the midfoot or even farther near the toes – you’ll appreciate the rubber rails that have lengthwise grooves for a gentle connection with the road. Those allow the shoe to flex and make gradual contact with the road. As your foot rolls to midstance, you have a generous amount of rubber making contact for sure grip on nearly any surface. The new bootie construction was a hit with testers. It’s soft and seam-free, so you can even go sockless if you desire. The fit is snug through the midfoot and generously roomy in the forefoot, so you feel secure without being cramped. Runners with narrower feet liked the Flywire lacing system that really let them cinch the shoe down. The back half of the shoe dials up the racing aesthetic. We appreciated the curve of the tall collar, which moved the material and padding away from the Achilles tendon, yet still secured the heel in place.